The usefulness of this text comes from showing how to calculate and analyze many aspects of the power system without relying on a computer analysis. [A] very useful text for an undergraduate or even graduate course in power engineering. It would also make for a good reference book for practicing power system engineers. 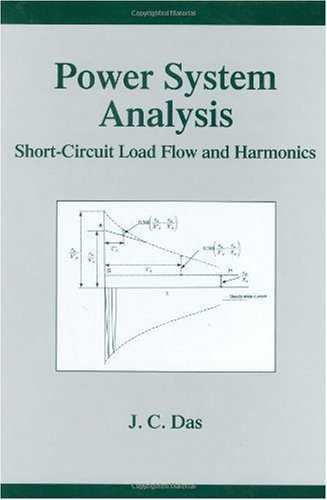 Featuring extensive calculations and examples, this reference discusses theoretical and practical aspects of short-circuit currents in ac and dc systems, load flow, and harmonic analyses to provide a sound knowledge base for modern computer-based studies that can be utilized in real-world applications. Presenting more than 2300 figures, tables, and equations, the author explores matrix methods for network solutions and includes load flow and optimization techniques. He discusses ac and dc short-circuit systems calculations in accordance with standards set by the American National Standards Institute (ANSI) and the International Electrotechnical Commission (IEC) .